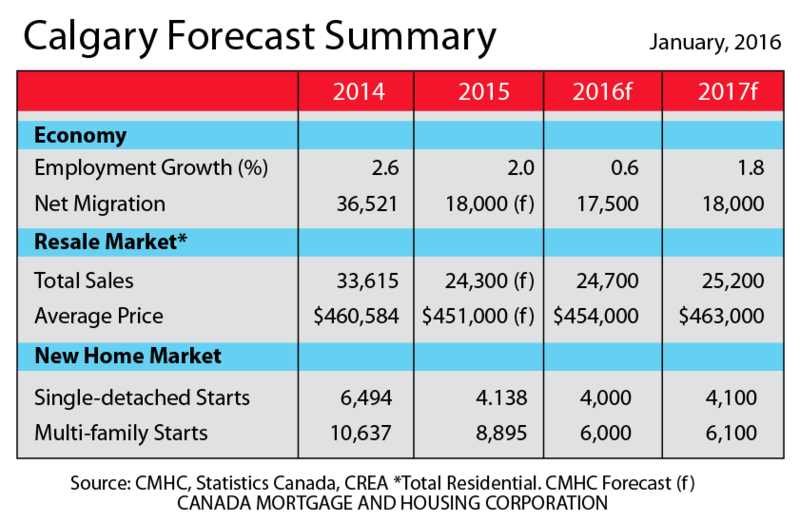 Calgary’s regional housing market in 2014 benefited from strong demand due to positive economic fundamentals. In 2015, however, several factors are pointing toward a pullback. Overall employment levels are forecasted to continue dropping as will net in migration, this coupled with energy sector uncertainty will impact housing demand negatively. The bright light on the horizon is the interest rates which are predicted to remain low throughout 2016 and into 2017. This indeed is a bright light as unemployment directly affects under 10% of the workforce while a large spike in interest rates would be far more pervasive and therefore more destructive. In the Calgary Census Metropolitan Area (CMA), total housing starts in 2015 are expected to decline from the record high reached in 2014. Both single-detached and multi-family construction will post pronounced year-over-year declines this year. The impact of lower oil prices on Calgary’s labor market has weakened demand for new homes. Migration to the region has also slowed as rising unemployment rates and more favorable economic conditions in other areas of the country attract fewer people to Calgary. Total housing starts are forecast to decline 31 per cent to 11,900 in 2015 from 17,131 in 2014.
starts are forecast to decline 31 per cent to 11,900 in 2015 from 17,131 in 2014. Home resales in the Calgary area in the second quarter partly rebounded from a five-year low in the first quarter that reflected a loss of confidence in the face of plunging oil prices. Buyer confidence was boosted by modest gains in oil prices in the second quarter—although with oil prices changing direction again in the third quarter, sentiment may come under renewed pressure. Another evidence of recovering confidence in the second quarter came on the supply side in the form of a sharp drop in new listings. Together, stronger resales (albeit still running some 26% below year-ago levels) and fewer homes available for sale rebalanced demand-supply conditions in the area, after briefly tilting in favour of buyers earlier this year. Nonetheless, home prices did not respond immediately to this rebalancing and generally continued to edge slightly lower in the second quarter. Maintenance of a slight downward trajectory for prices contributed to a third consecutive quarter of housing affordability improvement. RBC’s measures for Calgary fell for both two-storey homes (by 0.8 percentage points to 31.9%) and bungalows (by 0.4 percentage points to 32.4%), while the measure for condos remained little changed (advancing marginally by 0.1 percentage point to 19.5%). Owning a home in Calgary at market price remains more affordable than it has been on average since the middle of the 1980s; however, movements in oil prices are likely to exert a stronger influence on the market. The RBC Housing Affordability Measures show the proportion of median pre-tax household income that would be required to service the cost of mortgage payments (principal and interest), property taxes, and utilities on a detached bungalow, a standard two storey home and a standard condo (excluding maintenance fees) at the going market prices. The qualifier ‘standard’ is meant to distinguish between an average dwelling and an ‘executive’ or ‘luxury’ version. In terms of square footage, a standard condo has an inside floor area of 900 square feet, a bungalow 1,200 square feet, and a standard two-storey 1,500 square feet. The measures are based on a 25% down payment, a 25-year mortgage loan at a five-year fixed rate, and are estimated on a quarterly basis for each province and for Montreal, Toronto, Ottawa, Calgary, Edmonton, and Vancouver-metropolitan areas. The RBC Housing Affordability Measure is based on gross household income estimates and, therefore, does not show the effect of various provincial property-tax credits, which could alter relative levels of affordability. The higher the measure, the more difficult it is to afford a house. For example, an affordability measure of 50% means that home ownership costs, including mortgage payments, utilities, and property taxes take up 50% of a typical household’s pre-tax income. Qualifying income is the minimum annual income used by lenders to measure the ability of a borrower to make mortgage payments. Typically, no more than 32% of a borrower’s gross annual income should go to ‘mortgage expenses’—principal, interest, property taxes, and heating costs (plus maintenance fees for condos).